Histone modifications in tumorigenesis are increasingly recognized as important epigenetic factors leading to cancer. Increased phosphorylation levels of histone H3 as a result of aurora B and pMSK1 overexpression were observed in various tumors. We selected aurora B and MSK1 as representatives for testing various compounds and drugs, and found that squamocin, a bis-tetrahydrofuran annonaceous acetogenin, exerted a potent effect on histone H3 phosphorylation. GBM8401, Huh-7, and SW620 cells were incubated with 15, 30, and 60 μM squamocin for 24 h. The expressions of mRNA and proteins were analyzed by qRT-PCR and Western blotting, respectively. The cell viability was determined by an MTT assay. Cell cycle distribution and apoptotic cells were analyzed by flow cytometry. Our results showed that squamocin inhibited the proliferation of GBM8401, Huh-7, and SW620 cells, arrested the cell cycle at the G1 phase, and activated both intrinsic and extrinsic pathways to apoptosis. In addition, we demonstrated that squamocin had the ability to modulate the phosphorylation levels of H3S10 (H3S10p) and H3S28 (H3S28p) in association with the downregulation of aurora B and pMSK1 expressions. This study is the first to show that squamocin affects epigenetic alterations by modulating histone H3 phosphorylation at S10 and S28, providing a novel view of the antitumor mechanism of squamocin. Cancer is generally viewed as a set of diseases driven by genetic and epigenetic alterations. Epigenetics include the interrelated processes of DNA methylation, genomic imprinting, and histone modifications, and epigenetic aberrations may result in human cancers [1–4]. In the case of histone modifications, covalent modifications of the N-terminal tail domains, such as acetylation, methylation, and phosphorylation, are recognized as crucial epigenetic marks that modulate gene expression and genomic function. Aberrant histone modifications may be caused by improper activities of histone-modifying enzymes, leading to inappropriate expression of tumorigenesis-related genes [5, 6]. In mammalian cells, phosphorylation of histone H3 is correlated with processes of chromosome condensation during mitosis and transcription. In addition, H3 phosphorylation occurs at two serine residues, S10 and S28, which can be mediated by histone kinases including mitogen- and stress-activated protein kinase 1 (MSK1) and aurora B kinase [7–9]. Recent studies demonstrated that phosphorylation of histone H3 at Ser10 (H3S10p) is critical during neoplastic transformation, and the steady state level of H3S10p is elevated in oncogene-transformed cells and human tumor cell lines [10–13]. Moreover, increased phosphorylation levels of H3S10 resulting from aurora B and pMSK1 overexpression is a precipitating factor in chromosome instability and may play a role in carcinogenesis [14, 15]. It was suggested that regulating phosphorylation levels of histone H3 may be a possible target for cancer treatment. Under the assumption that targeting histone H3 phosphorylation by histone-modifying enzymes may have therapeutic potential for cancer treatment, we have been searching for small molecules that modulate enzymes involved in histone H3 phosphorylation in human cancer cells. Choosing aurora B and MSK1 as representatives to test various compounds and drugs, we found that squamocin (Figure 1) exerted a potent effect on histone H3 phosphorylation. We further used different cancer cell lines such as GBM8401, Huh-7, and SW620 to evaluate whether it has similar effects on different caners. We analyzed changes in the cell cycle and apoptosis, as well as histone H3 phosphorylation levels in association with expressions of these histone-modifying enzymes, in an effort to investigate the possible antitumor mechanism of squamocin. Structure of squamocin. Squamocin is characterized by a long alkyl chain bearing a terminal α, β-unsaturated γ-lactone ring, two tetrahydrofuran rings, and some oxygenated substitutes along the chain. Dulbecco's modified Eagle medium (DMEM), fetal bovine serum (FBS), trypan blue, penicillin G, and streptomycin were obtained from GIBCO BRL (Gaithersburg, MD, USA). 3-(4,5-Dimethylthiazol-2-yl)-2,5-diphenyltetrazolium bromide (MTT), dimethyl sulfoxide (DMSO), ribonuclease (RNase), and propidium iodide (PI) were purchased from Sigma-Aldrich (St. Louis, MO, USA). An Annexin V-FITC Staining Kit was purchased from Strong Biotech (Taipei, Taiwan). Antibodies against aurora B, H3S10p, and H3S28p were purchased from Abcam (Cambridge, UK). Antibodies against pERK, pMSK1, caspase-3, caspase-8, caspase-9, and GAPDH were obtained from Santa Cruz Biotechnology (Santa Cruz, CA, USA). Anti-PARP was purchased from Upstate Biotechnology (Charlottesville, VA, USA). Anti-mouse and anti-rabbit immunoglobulin G (IgG) peroxidase-conjugated secondary antibodies were purchased from Pierce (Rockford, IL, USA). Polyvinylidene difluoride (PVDF) membranes and an enhanced chemiluminescence (ECL) Western blotting detection kit were obtained from Amersham Life Science (Buckinghamshire, UK). Squamocin was provided by Prof. Yang-Chang Wu, Graduate Institute of Natural Products, Kaohsiung Medical University, Kaohsiung, Taiwan. The structure of this compound was verified by means of mass spectrometry and spectroscopic techniques . Squamocin was dissolved in DMSO (< 0.01%) and made up immediately prior to the experiments. The GBM8401, Huh-7, and SW620 cell lines were obtained from American Type Culture Collection (ATCC, Manassas, VA, USA), and are derived from brain, liver and colon cancers, respectively. Cells were maintained in DMEM which was supplemented with 10% FBS, 2 mM glutamine, and antibiotics (100 U/ml penicillin and 100 μg/ml streptomycin) at 37°C in a humidified atmosphere of 5% CO2. Cell viability was determined by an MTT assay, and results are presented as a percentage of the control. For the MTT assay, 10 μl of MTT (5 mg/ml) dye was directly added to the cell cultures. The medium was removed 2 h later, and cells were lysed with 100 μl of DMSO. The absorbance at 570 nm was read on a microplate reader. 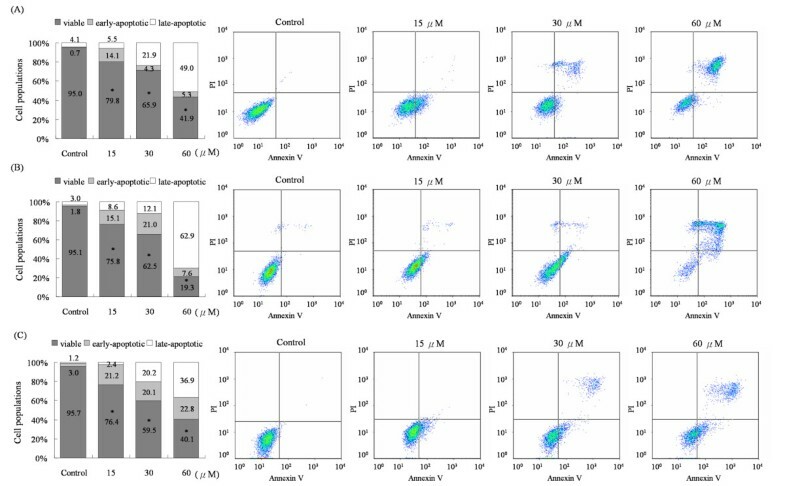 Externalization of phosphatidylserine (PS) and the membrane integrity were quantified using an Annexin V-FITC Staining Kit. Cells were washed twice with phosphate-buffered saline (PBS), and collected by centrifugation at 200 × g for 5 min at 25°C. Cells were resuspended in 100 μl of binding buffer and labeled with 2 μl of annexin V-FITC and PI for 15 min at 25°C. After labeling, cells were resuspended in 500 μl of binding buffer and detected on a flow cytometer using 488-nm excitation and a 515-nm band-pass filter for fluoresce detection and a filter > 600 nm for PI detection. To analyze the cell cycle distribution, cells were washed twice with PBS, collected by centrifugation at 200 × g for 5 min at 4°C, and fixed in 70% (v/v) ethanol at 4°C for 30 min. After fixation, cells were treated with 0.2 ml of the DNA extraction buffer (0.2 M Na2HPO4 and 0.1 M citric acid buffer; pH 7.8) for 30 min, centrifuged, and then resuspended in 1 ml of PI staining buffer (0.1% TritonX-100, 100 μg/ml RNase A, and 500 μg/ml PI in PBS) at 37°C for 30 min. Cells were detected using a flow cytometer and analyzed by FACScan and the Cell Quest program (Becton Dickinson, San Jose, CA, USA). Total proteins were extracted as previously described . Proteins were extracted from the experimental and control samples and analyzed by sodium dodecylsulfate polyacrylamide gel electrophoresis (SDS-PAGE) as follows: after electrophoresis, proteins were transferred from the gel onto PVDF membranes. The membranes were blocked with a skim milk solution (5% skim milk in PBS) and agitated for 30 min at room temperature. Membranes were exposed to the primary antibody and agitated for 1 h at room temperature before being washed three times for 10-min periods with PBST (0.05% Tween 20 in PBS), and then incubated for 1 h with the secondary antibody at a 1:2500 dilution. After incubation with the antibody, the membranes were washed three times with PBST for 10 min each and then immersed in an ECL solution (combining solutions A and B of the ECL kit in a 1:1 ratio) with agitation for 1 min. After washing, the blots were developed by ECL. RNA was isolated from cultured cells, and the analysis was performed as previously described . The PCR was performed in a final volume of 20 μl using a LightCycler instrument (Roche Diagnostics) according to the manufacturer's recommendations. The amounts of complementary (c)DNA were normalized to the housekeeping gene, GAPDH, to calculate the relative expressions of aurora B and MSK1 RNA (Table 1). Primers used to detect these genes were designed using ProbeFinder software http://www.roche.com and were synthesized by custom oligonucleotide synthesis (Genomics, Taipei, Taiwan). The qRT-PCR cycling parameters were set as follows: 40 cycles of 95°C for 10 s (denaturation), followed by 60°C for 30 s (annealing), and 72°C for 1 s (extension). Results from multiple experiments are expressed as the mean ± standard error. The difference between the treatment and control groups was analyzed by Student's t-test. A probability (p) value of < 0.05 was considered significant. Aurora B and MSK1 are thought to be involved in chromatin organization, gene expression, and carcinogenesis [14, 15]. 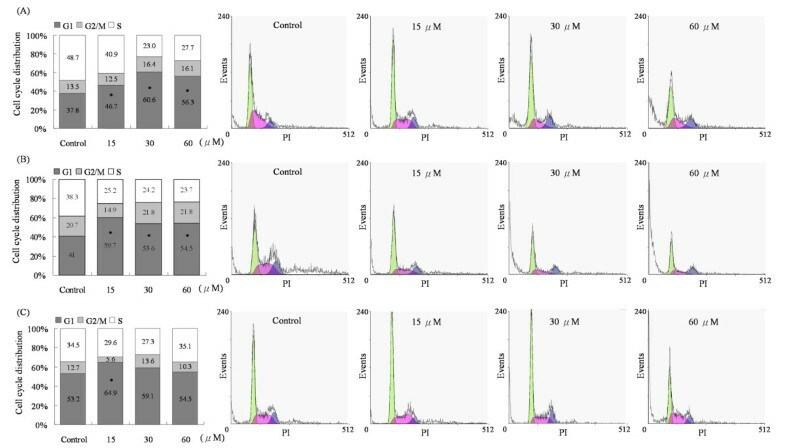 More than 20 compounds with cytotoxic effects were screened, and we found a compound, squamocin, isolated from several genera of the plant family Annonaceae, which decreased (m)RNA expression levels of aurora B and MSK1 in cancer cells. The expressions of aurora B and MSK1 were significantly downregulated in squamocin-treated GBM8401, Huh-7, and SW620 cells compared to the control (Figure 2). Similarly, squamocin treatment decreased the protein expression levels of aurora B and phosphorylated MSK1 (pMSK1) (Figure 3). These results imply that squamocin regulates aurora B and MSK1 activities at the transcriptional and translation levels. Squamocin decreased expression levels of RNA of aurora B and MSK1. GBM841, Huh-7 and SW620 cells were incubated with 30 and 60 μM squamocin for 24 h. mRNA was extracted and detected by qRT-PCR. Data represent fold change versus controls, and values were normalized to GAPDH. Data are the mean of three independent experiments. * p < 0.05, compared to the control. Downregulation of aurora B, pMSK1, H3S10p, and H3S28p protein expression levels was observed with squamocin treatment. Cells were incubated with 15, 30, and 60 μM squamocin for 24 h. Proteins were extracted and analyzed by Western blotting. GAPDH was used as a loading control. (A) GBM841 cells. (B) Huh-7 cells. (C) SW620 cells. Data are representative of three independent experiments. In eukaryotes, aurora B and MSK1 are linked to the phosphorylation of H3S10 and H3S28 [7–9]. In order to investigate the effects of squamocin on H3S10p and H3S28p, cells were treated with squamocin for 24 h, and the protein expression levels were analyzed by Western blotting. The results showed that decreased H3S10p and H3S28p protein expression levels were detected in squamocin-treated cells (Figure 3). Our experiment revealed that squamocin treatment decreased phosphorylation of histone H3S10 and H3S28, as well as caused declines in the protein and RNA expression levels of aurora B and pMSK1. The modulation of H3S10 and H3S28 phosphorylation by aurora B and/or pMSK1 indicates that squamocin probably decreased the phosphorylation of H3S10 and H3S28 by downregulating aurora B and pMSK1 in cancer cells. The growth-inhibitory activity of squamocin was assessed by an MTT assay. GBM8401, Huh-7, and SW620 cells were treated with different concentrations (15~120 μM) of squamocin for 24 h. The results showed that squamocin-treated cancer cells exhibited significant loss of viability in dose-dependent manners (Figure 4). The 50% inhibitory concentrations (IC50) of GBM8401, Huh-7, and SW620 cells were 46.1, 39.4, and 40.4 μM, respectively. Inhibition of cancer cell growth by squamocin. GBM8401, Huh-7, and SW620 cells were treated with the indicated concentrations of squamocin, and cell viability was determined by an MTT assay. Data are the mean of three independent experiments. * p < 0.05, compared to the control. To further evaluate the potential relevance of histone H3 phosphorylation in cancer therapy, we examined the effects of squamocin on cell growth and viability. Cells were treated with squamocin for 24 h, and the cell cycle distribution and apoptosis were measured by a flow cytometric analysis. Squamocin treatment significantly increased the population of G1 phase cells (Figure 5). Also, high levels of apoptosis were detected in squamocin-treated cells (Figure 6). 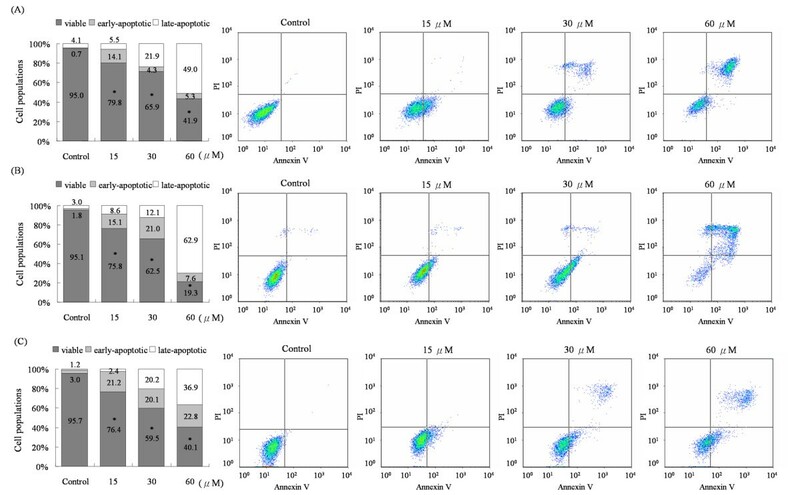 As shown in Figure 5, treatment of cells with 0, 15, 30, and 60 μM of squamocin resulted in G1 phase accumulation of cells corresponding to 37.8%, 46.7%, 60.6% and 56.3%, respectively in GBM841 cells (Figure 5A), 41%, 59.7%, 53.6%, and 54.5%, respectively in Huh-7 cells (Figure 5B), and 53.2%, 64.9%, 59.1%, 54.5%, respectively in SW620 cells (Figure 5C). Moreover, squamocin-treated cells were stained with propidium iodide (PI) and annexin V to determine the apoptotic cells. Cells were differentiated among viable (annexin V, PI double negative), early-apoptotic (annexin V positive, PI negative) and late-apoptotic (annexin V, PI double positive) cells. Treatment of cells with 0, 15, 30, and 60 μM of squamocin increased the percentage of early apoptosis from 0.7% to 14.1%, 4.3%, and 5.3%, respectively and late apoptosis from 4.1% to 5.5%, 21.9%, and 49%, respectively in GBM8401 cells (Figure 6A), early apoptosis from 1.8% to 15.1%, 21%, and 7.6%, respectively and late apoptosis from 3.0% to 8.6%, 12.1%, and 62.9%, respectively in Huh-7 cells (Figure 6B), and early apoptosis from 3.0% to 21.2%, 20.1%, and 22.8%, respectively and late apoptosis from 1.2% to 2.4%, 20.2%, and 36.9%, respectively in SW620 cells (Figure 6C ). Further, we extended our study to apoptosis-associated molecules and found that increasing levels of caspase-3, -8, and -9 activities and cleavage of poly ADP-ribose polymerase (PARP) were observed in squamocin-induced apoptosis (Figure 7). From the results, it is evident that squamocin affected cell cycle progression and apoptosis. Squamocin induced cell cycle arrest at the G 1 phase. Cells were treated with 15, 30, and 60 μM squamocin for 24 h, and then cells were stained with propidium iodide (PI) and analyzed for DNA content by flow cytometry. G1, S, and G2/M indicate cell phase. Cells without squamocin treatment served as a control. (A) GBM841 cells. (B) Huh-7 cells. (C) SW620 cells. Data are the mean of three independent experiments. * p < 0.05, compared to the control. High levels of early and late apoptosis were detected after squamocin treatment. Cells were incubated with 15, 30, and 60 μM squamocin for 24 h. Apoptotic cells were determined by a PI and annexin V double-staining assay and analysis by flow cytometry. Annexin V-/PI-, annexin V+/PI- and annexin V+/PI+ cells were respectively considered to be viable, early-apoptotic, and late-apoptotic cells. Cells without squamocin treatment served as a control. (A) GBM841 cells. (B) Huh-7 cells. (C) SW620 cells. Data are the mean of three independent experiments. * p < 0.05, compared to the control. Effects of squamocin on apoptosis. Cells were treated with 15, 30, and 60 μM squamocin for 24 h. Proteins were extracted and analyzed by Western blotting. GAPDH was used as a loading control. Squamocin enhanced caspase-3, -8, and -9 activities, cleaved the functional protein of PARP, increased phosphorylation levels of ERK, and decreased phosphorylation levels of JNK. (A) GBM841 cells. (B) Huh-7 cells. (C) SW620 cells. Data are representative of three independent experiments. The MAPK signaling pathway is implicated in a wide range of cellular functions, including cell proliferation, differentiation, survival, and apoptosis . To assess whether activation of the MAPK signaling pathway is involved in squamocin-induced apoptosis, we investigated the activities of MAPK. The results showed that squamocin treatment significantly decreased ERK phosphorylation (pERK) levels and increased JNK phosphorylation (pJNK) levels (Figure 7). It was determined that activation of JNK affects members of the Bcl-2 family and activates caspases-3, -8, and -9 which results in apoptosis, whereas ERK is connected to cell survival [20, 21] Our results indicate that inhibition of ERK and activation of JNK may participate in squamocin-induced apoptosis. Annonaceous acetogenins are highly neurotoxic molecules and have been considered as new antitumor agents found in the plant family, the Annonaceae [22–24]. Extensive studies on annonaceous acetogenins indicated that these naturally occurring compounds possess a broad range of biological activities, including anticancer, antiparasitic, insecticidal, and immunosuppressive effects [25, 26]. On the other hand, recent studies demonstrated that annonaceous acetogenins can be converted to activity-based probes for chemical proteomics. These probes were able to identify new putative targets including mitochondrial, cytosolic, and reticulum associated enzymes [27, 28]. Squamocin, an annonaceous acetogenin, is a major component of various genera of the Annonaceae. Our previous studies showed that squamocin induces potent cytotoxicity against a variety of cancer cells . In this report, we found that squamocin caused cell cycle arrest and apoptosis in three cancer cell lines. 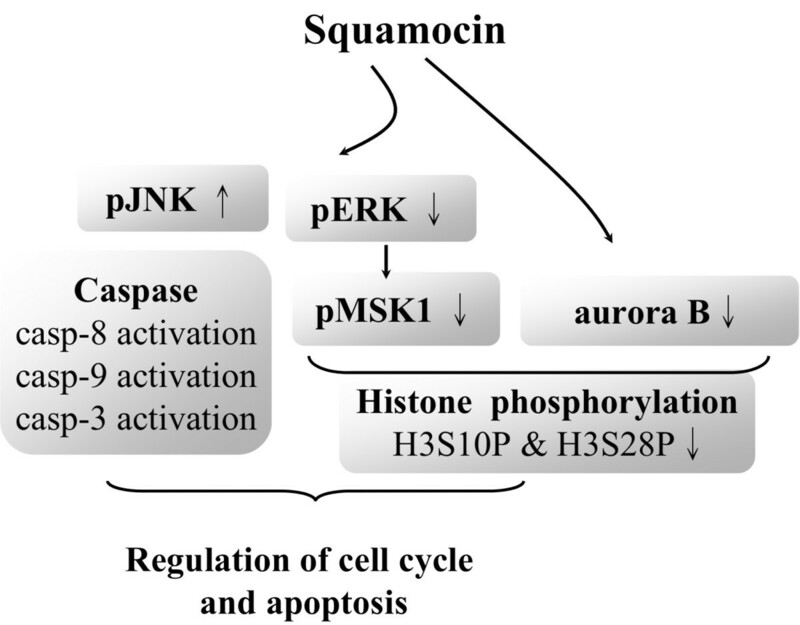 In addition, squamocin decreased the phosphorylation levels of H3S10 and H3S28 by downregulating aurora B and pMSK1 expressions, which might be the antitumor mechanism of squamocin. Apoptosis, or programmed cell death, is known to participate in various biological processes. Two main apoptotic pathways were described: the mitochondrial (intrinsic) pathway and the death receptor (extrinsic) pathway. Both pathways induce activation of caspases and cause cell death. The intrinsic apoptotic pathway results from cytochrome c release from mitochondria into the cytosol and activates the initiator caspase-9 and the extrinsic apoptotic pathway results from activation of death-domain receptors and activates the initiator caspase-8 . In addition, it is generally accepted that the biological activity of annonaceous acetogenins is the inhibition of nicotinamide adenine dinucleotide (NADH)-ubiquinone oxidoreductase (complex I) of the mitochondrial electron transport . This inhibition suppresses mitochondrial membrane potential and ATP production as well as leads to intrinsic apoptotic pathway [31–33]. In our experiment, increasing levels of caspase-8 and -9 activities were detected in squamocin-treated cells, indicating that squamocin activated both intrinsic and extrinsic pathways to apoptosis in cancer cells. In mammals, the ERK signaling pathway is the best studied of the MAPK pathways. Inappropriate regulation of the ERK pathway is connected to neoplastic transformation and tumor development. Most cancer-associated lesions that lead to constitutive ERK activation are associated with uncontrolled cell proliferation . Thus, therapeutic targeting of individual components of the ERK pathway has attracted much attention for developing antitumor agents. Inhibition of ERK signaling could induce an early depletion in cellular ATP coincident with a loss of mitochondrial membrane potential, and lead to cytosolic release of mitochondrial proteins and caspases activation . Besides, cell cycle arrest and apoptosis caused by ERK inhibition were observed in various cancer cell lines, indicating the potential utility in antitumor agent activity [36, 37]. MSK1 is a serine/threonine protein kinase that can be phosphorylated by activated ERK (phosphorylated ERK) to promote kinase catalytic activity in response to multiple stimuli [38, 39]. In our experiment, pERK downregulation was detected in squamocin-treated cells, and simultaneously caused a decline in the expression of pMSK1. It is probable that squamocin decreased the ERK cascade to reduce MSK1 phosphorylation. Cancer cells frequently undergo mitosis, and many mitotic regulators are aberrantly expressed in these cells. Aurora B, a chromosomal segregation protein, is expressed during mitosis and carries out vital functions such as chromosome alignment, a spindle-checkpoint function, and cytokinesis . Abnormally elevated expression of aurora B was detected in many human cancer cells, and this overexpression is linked to genomic instability which contributes to tumorigenesis . Accordingly, aurora B inhibitors are important factors in cancer therapeutics. In this study, squamocin treatment decreased the expression of aurora B and also of pERK in cancer cells. The data suggest that squamocin may have potential therapeutic value in treating cancer. Several studies demonstrated the roles of histone H3S10 and H3S28 phosphorylation in response to stimuli or other stresses [42, 43]. In eukaryotes, histone H3 phosphorylation is altered along with cell mitosis. This phosphorylation is correlated with chromosome condensation prior to mitosis, and when chromosomes are dephosphorylated in mitosis, it induces chromosome decondensation . In addition, it was reported that phosphorylation of H3S10 and H3S28 appears in the G2/M phase, and thus, both of them are widely used as cell cycle markers to index the G2/M stages [44, 45]. Our experiment showed that histone H3 phosphorylation at S10 and S28 was reduced by squamocin, and the cell cycle was accordingly arrested at the G1 phase. This indicates that the decreased phosphorylation of H3S10 and H3S28 presumably caused a failure of cell cycle progression and resulted in G1 phase arrest with squamocin treatment. It is well known that annonaceous acetogenins are the most potent inhibitors of the mitochondrial respiratory chain complex I . The number of compounds that inhibit complex I is increasing, and parts of the diverse inhibitors, such as rotenoids, piericidins, and myxobacterial antibiotics could be gained from natural products. These inhibitors have been reported to display various activities in the inhibition of mitochondrial complex I . Moreover, several reports have showed that the mitochondrial complex I inhibitor can reduce the phosphorylation levels of ERK , promote the activity of JNK [47, 48] and caspases [49, 50] as well as cause cell cycle arrest  and apoptosis . Although the effects of these inhibitors were similar to the effects of squamocin, the squamocin treatment showed a new effect on histone modifications. Therefore, inhibition of mitochondrial complex I, modulation of histone or both may lead to the squamocin-induced cell cycle arrest and apoptosis, but the real mechanism needs further investigation. Taken together, squamocin, a bis-tetrahydrofuran annonaceous acetogenin isolated from several genera of the plant family, the Annonaceae, induces G1 phase arrest and activates both intrinsic and extrinsic pathways to apoptosis in cancer cell lines. This study is the first to show that squamocin affects epigenetic alterations by modulating histone H3 phosphorylation at S10 and S28 (Figure 8), providing a novel view of the antitumor mechanism of squamocin. Hypothetical schematic diagram of squamocin-induced cell cycle arrest and apoptosis in cancer cells. Based on our results, squamocin could induce the activation of JNK and caspases, and decrease the phosphorylation levels of H3S10 and H3S28 by downregulating the expression of pERK, pMSK1, and aurora B. We proposed the hypothesis that histone dephosphorylation and activation of JNK and caspases contribute to squamocin induced cell cycle arrest and apoptosis. This work was supported by research grant DOH100-TD-C-111-002 from the Cancer Center, Kaohsiung Medical University Hospital, Taiwan and KMU-EM-99-5-1 from the Center of Excellence for Environmental Medicine, Kaohsiung Medical University, Taiwan. CCL performed the experiments and drafted the manuscript. YHL and WHC helped to design the study. PCL participated in the coordination of the study. YCW and JGC design the study. All authors read and approved the final manuscript.